Walnut Elfa décor Desk Tops is rated 4.3 out of 5 by 12. Is it possible to cut it down in width? 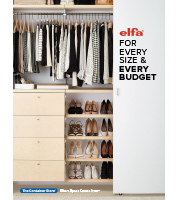 The elfa d&eacute;cor Desk Tops cannot be adjusted. They each have finished ends with the necessary hardware that allows them to attach to the Ventilated Shelf Brackets.